We’ve been having quite a few cold and snowy days here lately down South. I live in Arkansas and we rarely ever see snow but we finally got to see some this year, which I am most grateful for! 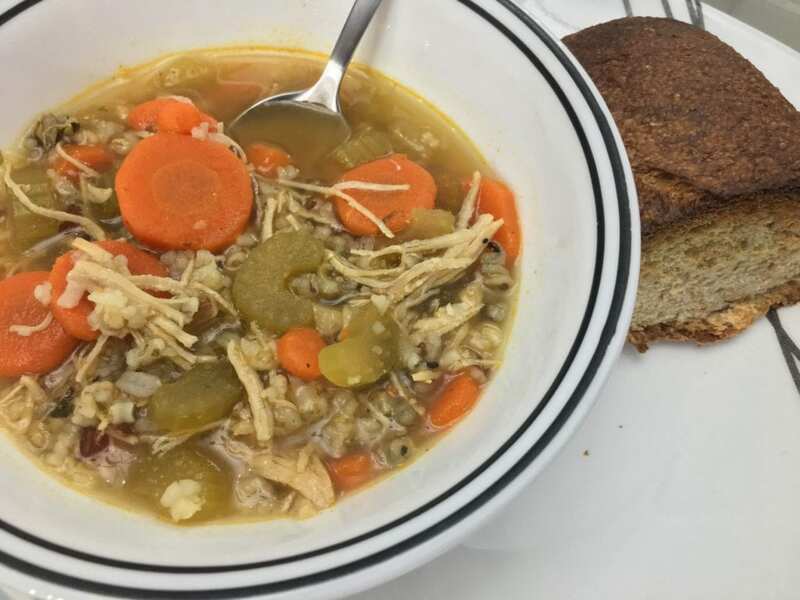 With all of the snow, it is definitely soup weather and what better meal to warm you on a cold day than Chicken & Wild Rice Soup! This soup is hearty, delicious, comforting, and smells oh so wonderful simmering and bubbling on your stove. 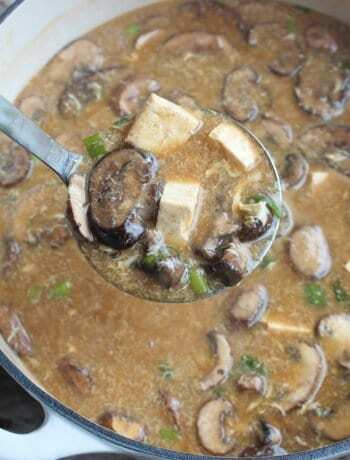 Without further ado, let’s jump straight into making this Chicken & Wild Rice Soup! Before we start tossing in ingredients, let me show you a sneak peak of the finished product. Oh, did you notice my Pioneer Woman wooden spoon? 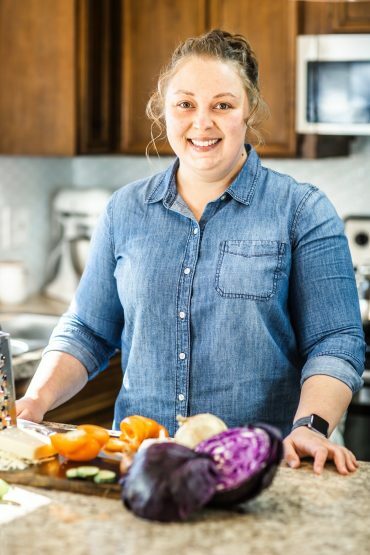 I LOVE Ree Drummond‘s wooden spoons and spatulas for cooking! Just gonna give ya one more close up shot before we start in. 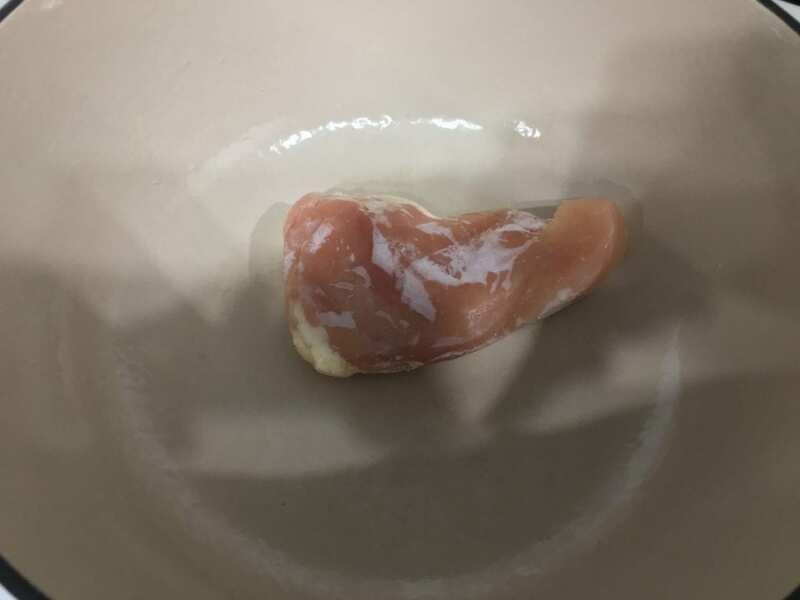 First we’re going to start out with one large, frozen, boneless skinless chicken breast. I know only one seems like such a small amount but trust me, once you add in everything else, this will be plenty. 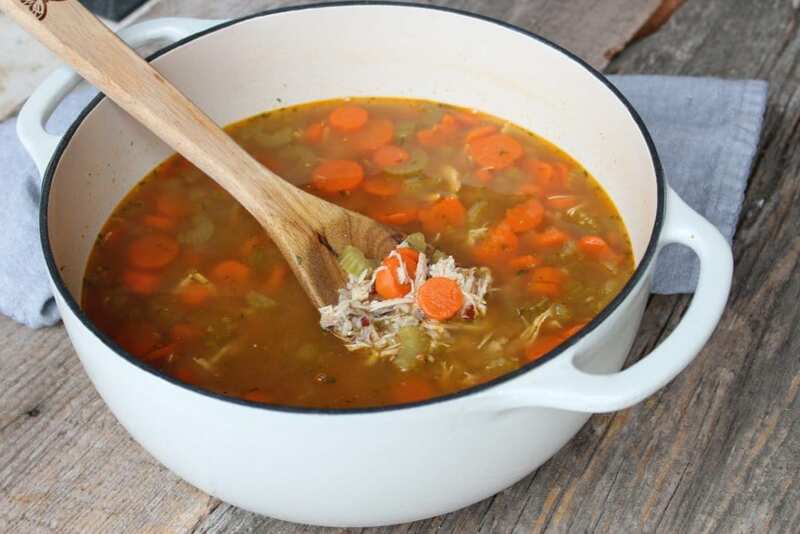 I’m using my 6 quart dutch oven here to make this Chicken & Wild Rice Soup, but you can use a large stock pot if you don’t have a dutch oven. Once the chicken is in the pan, add in 4 cups of bone broth or chicken broth. 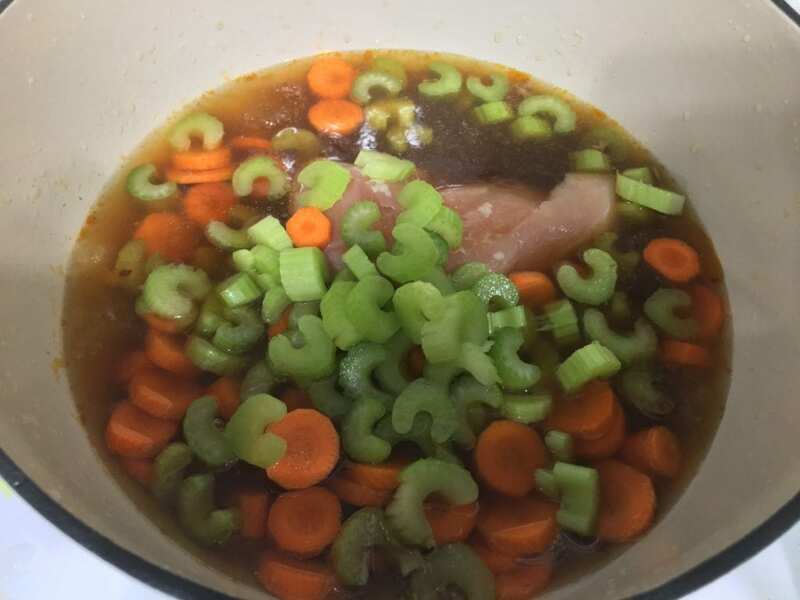 I used my own, homemade Slow Cooker Bone Broth for this soup. 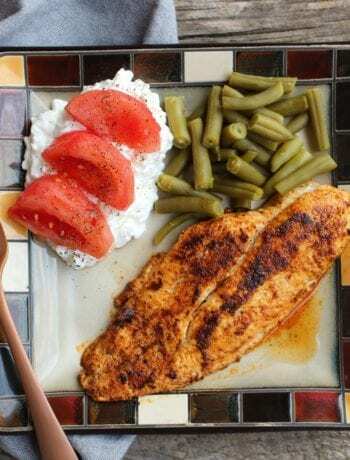 Check out the recipe if you’re interested! If your broth is frozen like mine was, pop it in the microwave for a few minutes and thaw it before adding it to the soup. 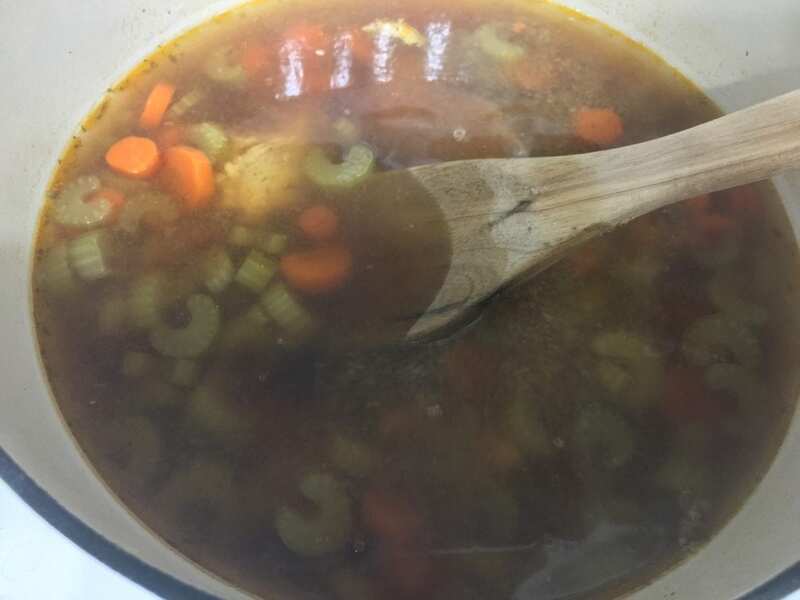 After you’ve added in the broth, grab 5 large carrots and 3 stalks of celery. Cut the ends off of both vegetables and use a potato peeler to peel the carrots. Time to get to choppin’! 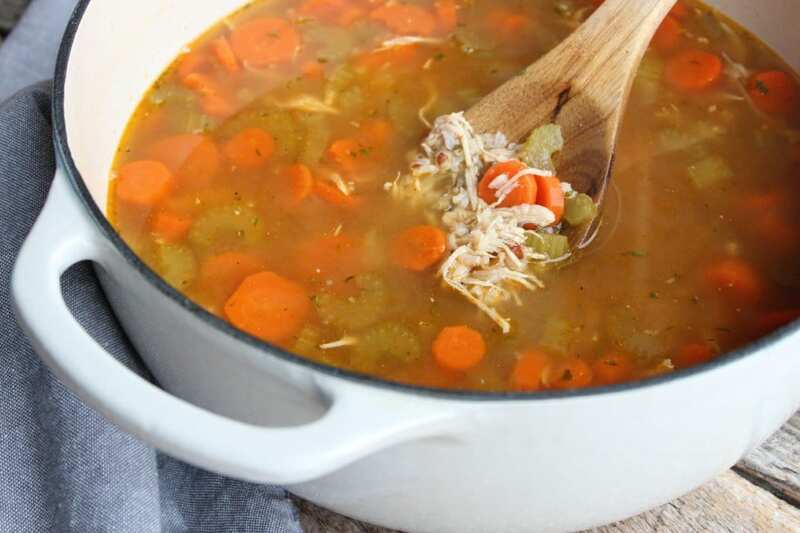 Chop the carrots and celery and toss them in the pot with the chicken and bone broth. 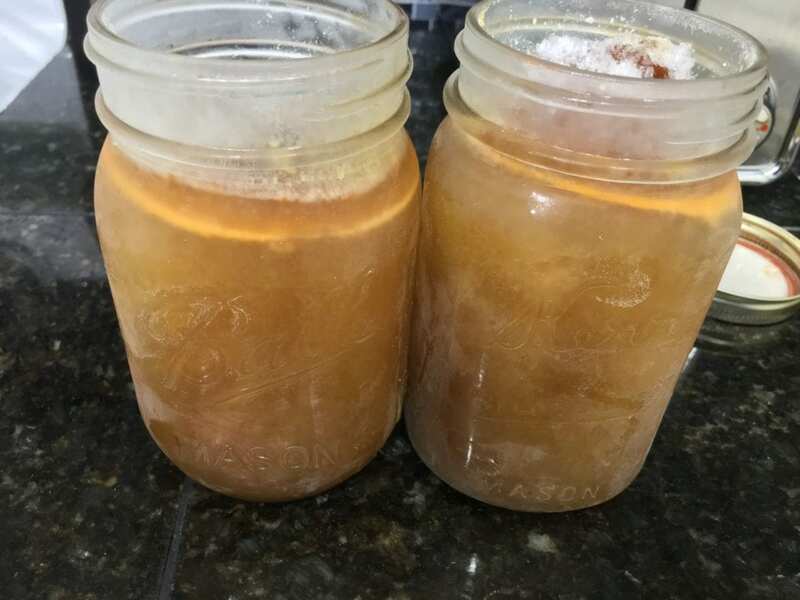 As you can see, 4 cups of bone broth isn’t going to be enough liquid, so add in 1 1/2 – 2 cups of water depending on how soupy you want your soup to be. 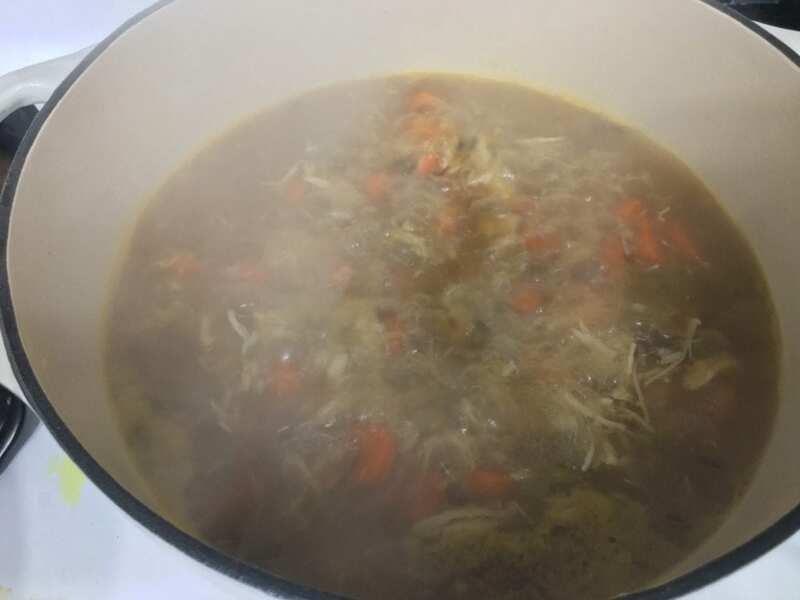 Now it’s time to add in two of the magic ingredients that make this Chicken & Wild Rice Soup SO flavorful and wonderful. Start off with one pinch of dried rosemary and one bay leaf. 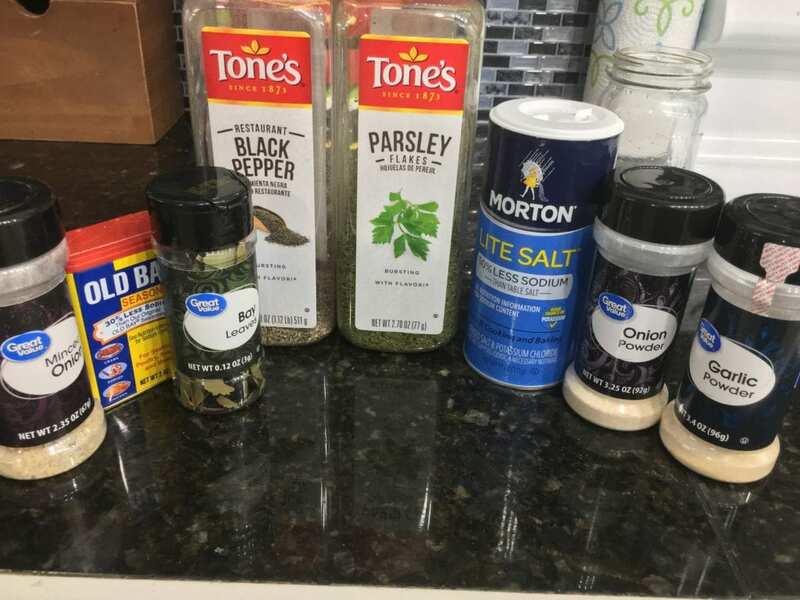 Add in 1/2 of a teaspoon of the seasonings pictured below. This is where you get to customize the recipe and make it your own. I alway season by instinct rather than measurements, so use the measurements I give you as a guide and use more or less depending on your own personal preference. 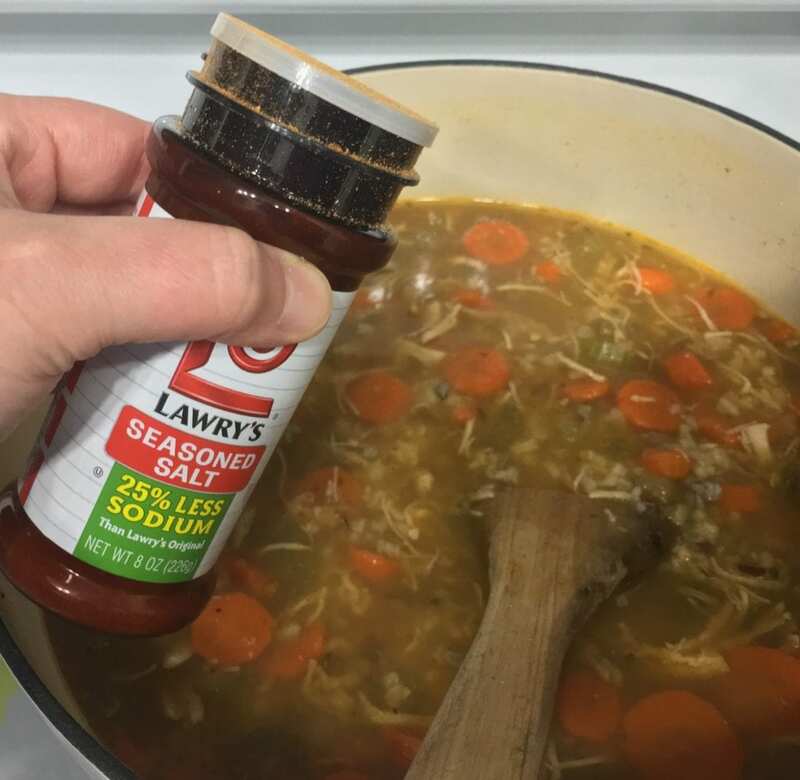 I decided to add in some Lawry’s Low Sodium Seasoned Salt for some extra flavor. Then unwrap three chicken bullion cubes and toss them in. 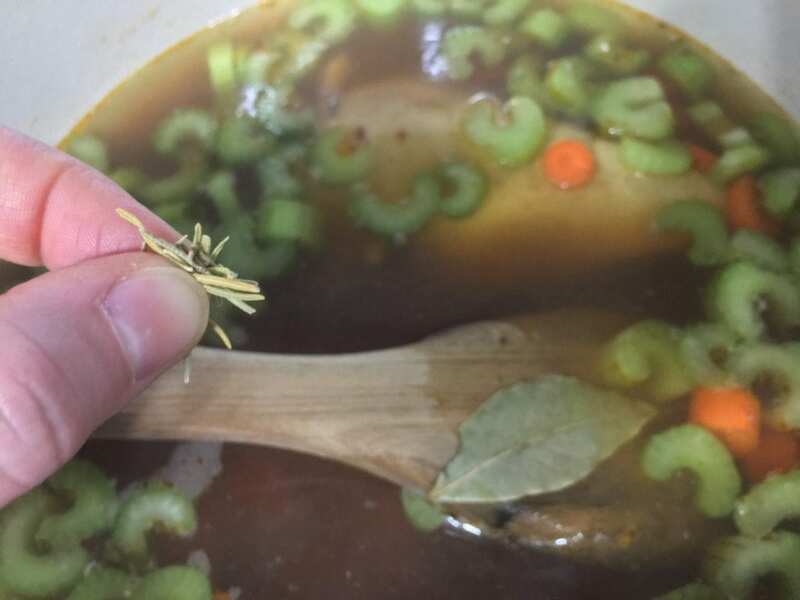 Now that you’ve added all of your seasonings, give the soup a good stir. 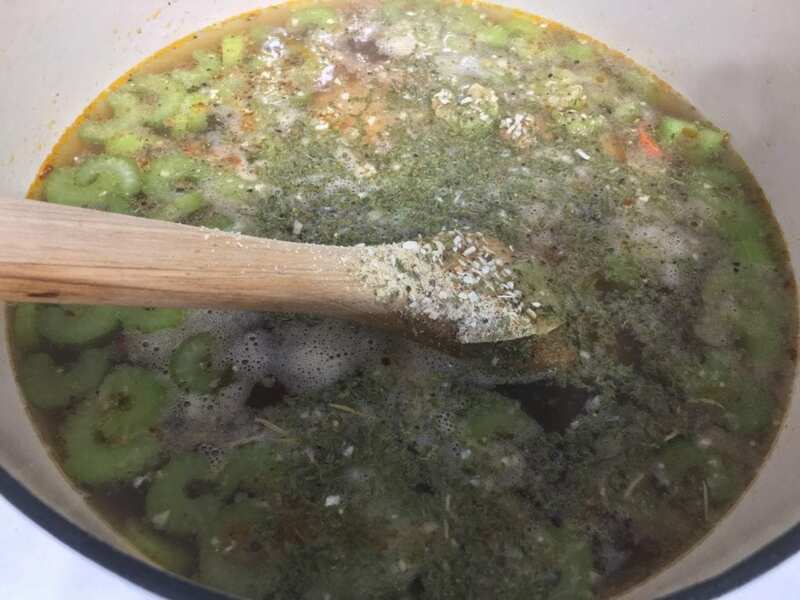 Place the lid on your dutch oven or stock pot and set the heat to medium. You want to boil the chicken and vegetables low and slow until the chicken is cooked through and the vegetables are tender. This will need to cook at a low boil for about 30 minutes. Just check the chicken and vegetables halfway through to see where it’s at and go from there. Once the chicken is cooked through, remove it from the pot. Remove the cooked chicken from the soup and trim away any fat or nasties from the chicken and then shred between two forks. 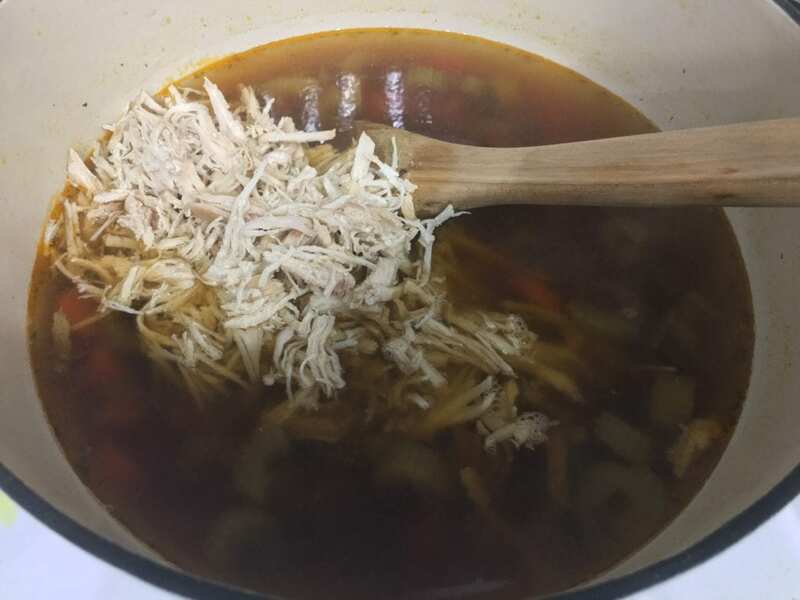 Add the shredded chicken back into the pot of soup and stir. Time to add the wild rice! 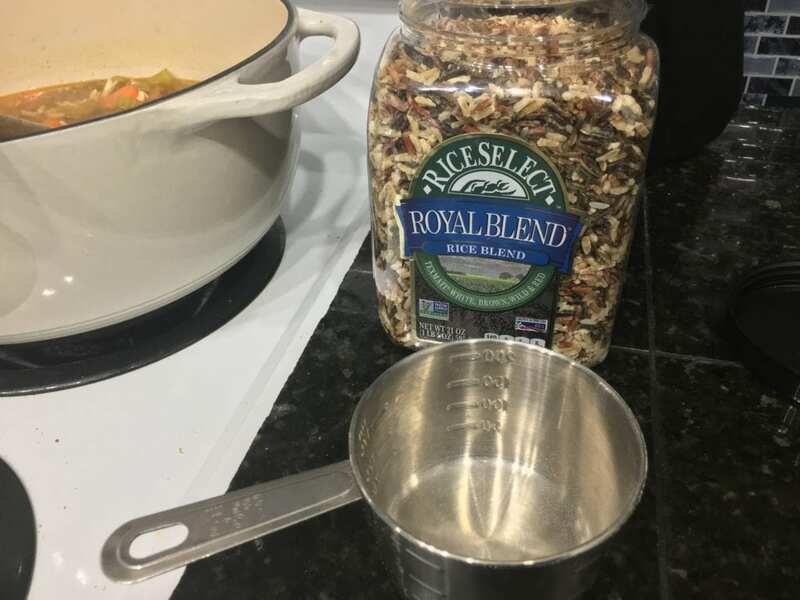 I poured in 1 cup of this Rice Select Royal Rice Blend. 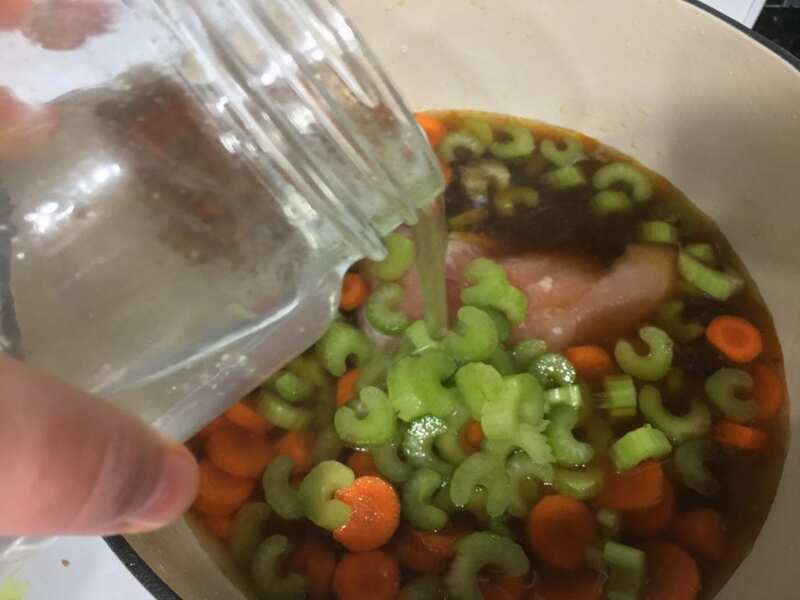 Give this all a good stir. Place the lid back on the pot and cook the rice in the soup according the the directions on the back of the rice container. Once the cook time is complete, remove the lid from the Dutch oven and remove from heat. 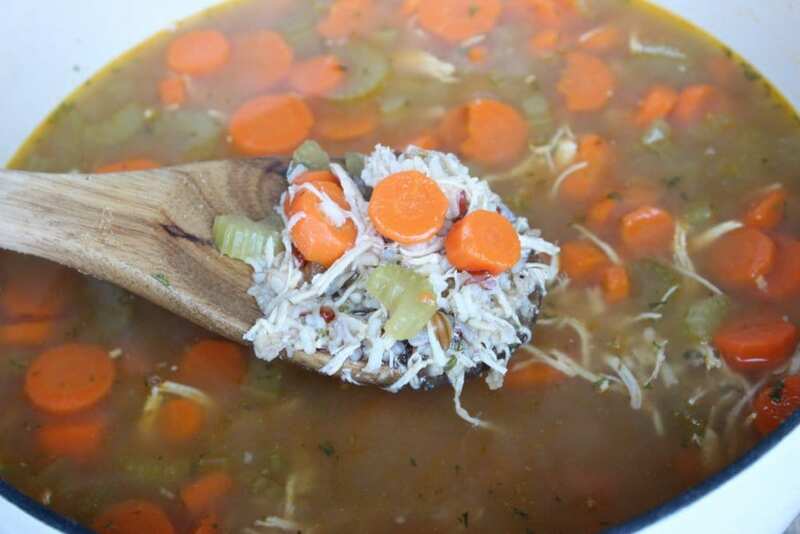 Are you ready to dig into this Chicken & Wild Rice Soup? I sure hope so because as soon as you remove the Bay leaf that we used to season the soup with, it will be ready to eat! I served our soup with some toasted whole wheat French bread on the side for dunking. It sure was good! Basically, a hug in a bowl! I hope you have enjoyed cooking along with me today! Happy eating! 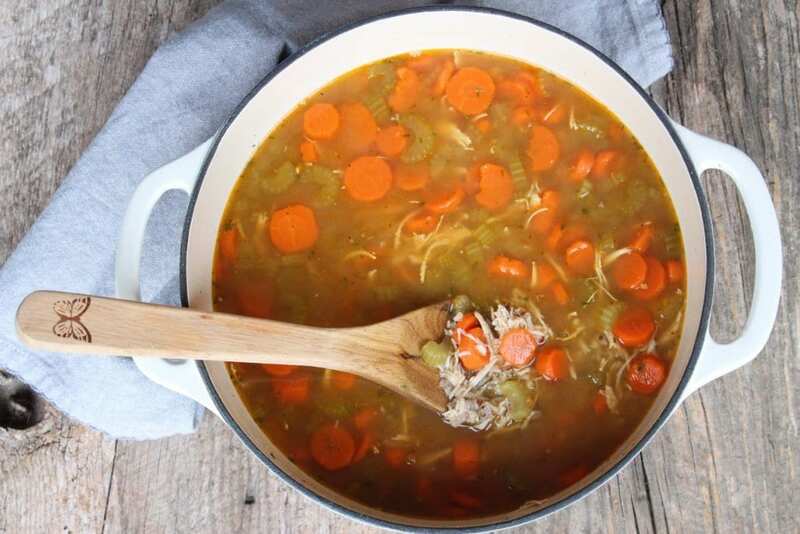 A delicious and comforting, Gluten Free soup that is full of tender chicken, sweet carrots, celery, bone broth, and wild rice soup with the wonderful flavors of rosemary and bay. 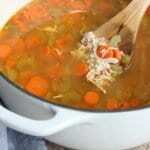 Place the chicken breast into a 6 quart Dutch Oven or stock pot and add in the broth and water. Wash and peel the carrots, removing both ends, and wash and remove the ends from the celery stalks. 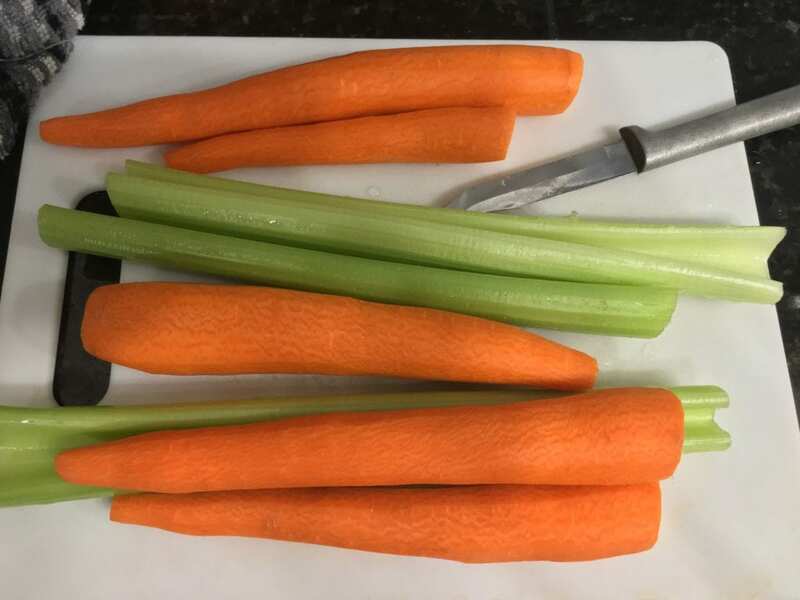 Chop the carrots into small rounds and chop the celery into half moons. Add the veggies to the pot and add in all seasonings. Place the lid on the pot and set heat to medium. Boil low and slow until chicken is cooked through and veggies are tender. This will take around 25-30 minutes. 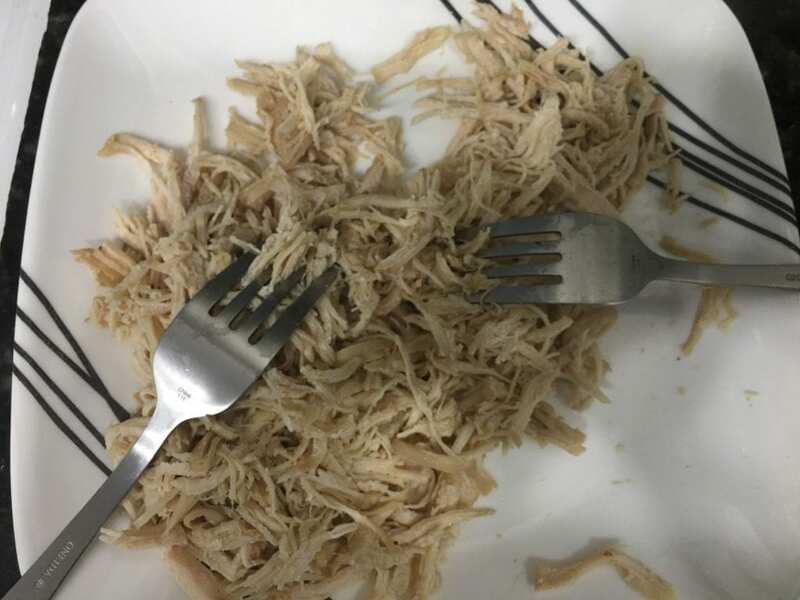 Once the chicken is cooked through, remove it, shred between two forks, and add the cooked, shredded chicken back into the pot. 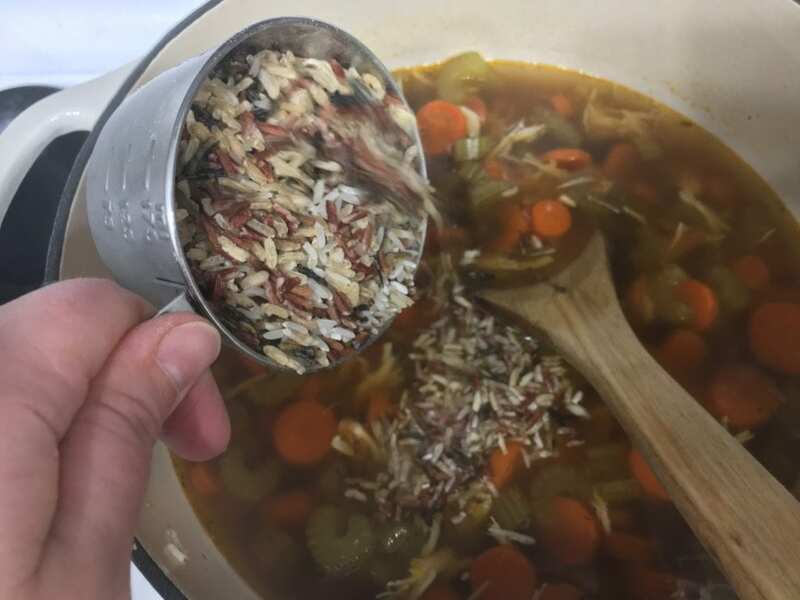 Pour in 1 cup of uncooked wild rice and cook in the soup according to package directions. 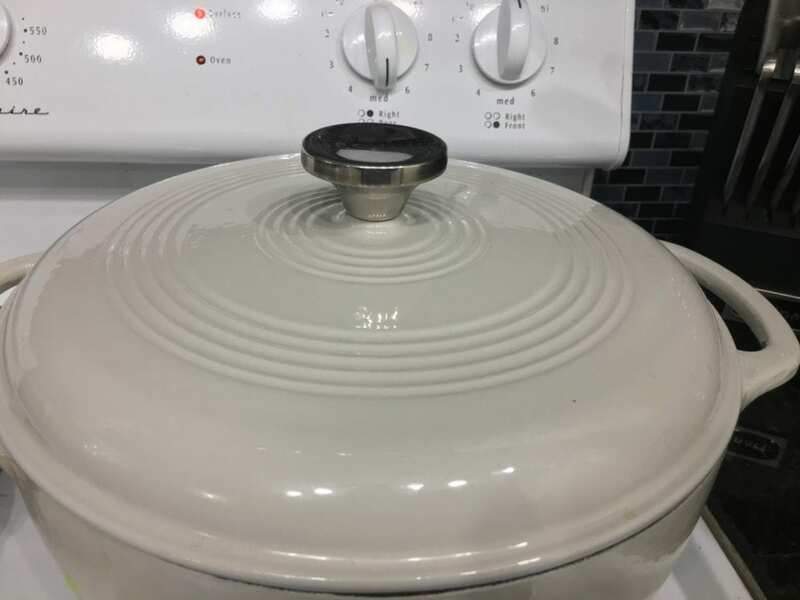 Once the rice is cooked, turn the heat off and remove the lid. Remove the bay leaf before serving and enjoy! 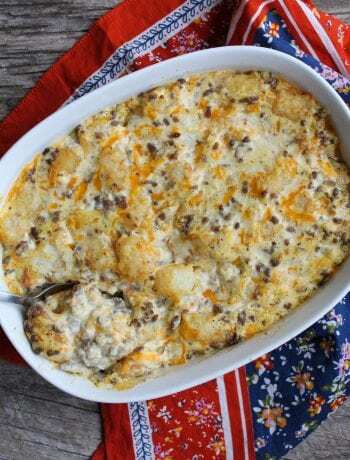 Recipe comes to 4 Freestyle Smart Points for each 1 cup servings. Recipe yields 8 cups. 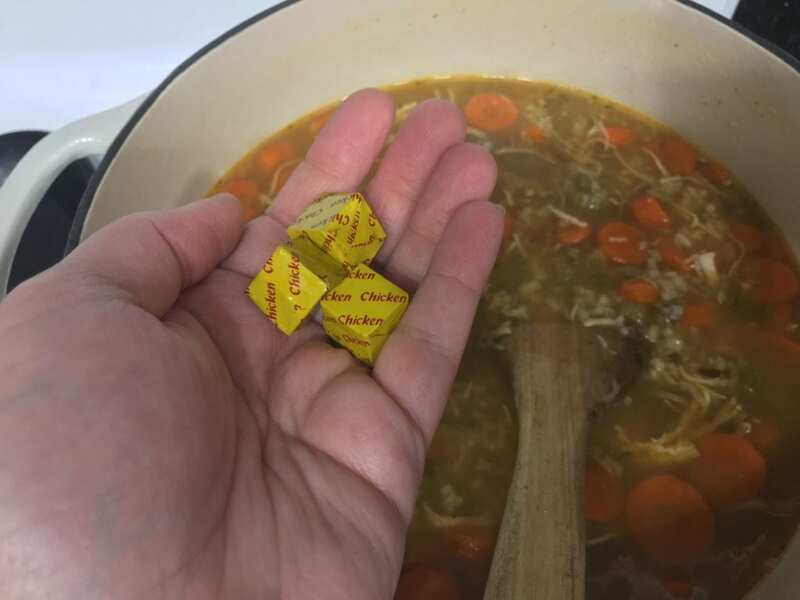 I cannot find bouillon cubes without msg. Great soup without but added a chicken carcass to make up for the bouillon. That’s a wonderful tip! Thank you! 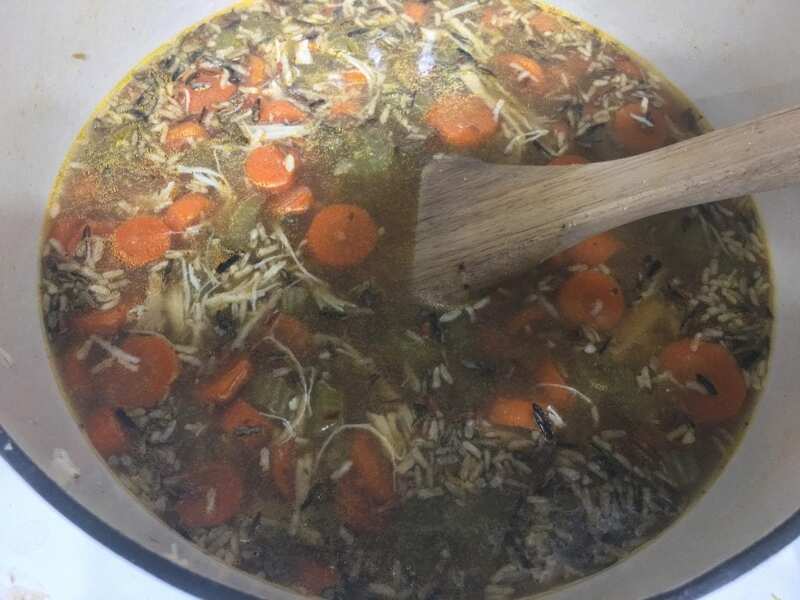 I don’t know if you have a Whole Foods near you or if your local grocery store sells it, but “Better Than Bouillon” is an organic, msg – free, chicken bouillon substitute that is healthy and worry free!